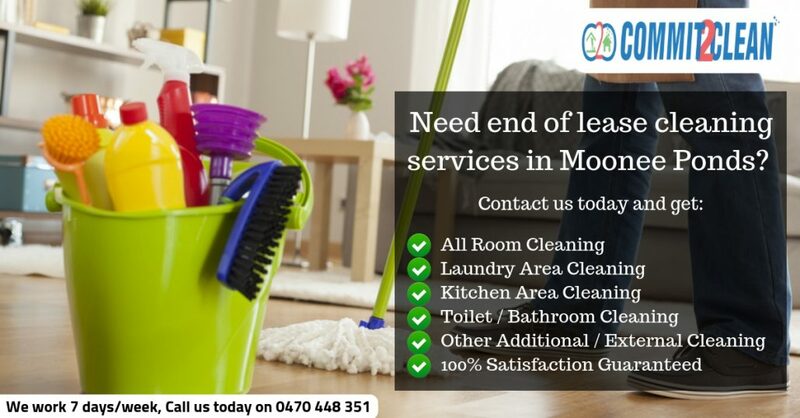 Looking for end of lease cleaning Moonee Ponds? A good cleaning agency relies strongly on the cleaning teams working for it. Commit2clean‘s Moonee Ponds cleaners have proven that they are one great team, which takes its duties very responsibly. Whether you need end of lease cleaning so you can get your security deposit back from the landlord or you simply need carpet or vacate cleaning, Moonee Ponds cleaners are here to help. Fully qualified and trained cleaners! They use top of the range cleaning equipment and products, which are safe to the environment and your family. In the case of end of lease cleaning, the team issues certificates stating that the property has been professionally cleaned and it falls under their 100% bond back guarantee. This means that if the customer or the landlord is not happy with the provided services, the team will return to the property and clean again without charging extra for it. Don’t hesitate to give us a call if you have any questions or you require a personal quote for your home. Our lines are open 7 days a week and any queries will be answered by our friendly customer service team. You can also get in touch via email info@commit2clean.com or call on 0470 448 351. Please note that if you have decided to email us, it may take up to 48 hours for us to reply. So, if your request is urgent, please telephone us and we can respond straight away.